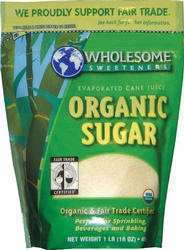 My friend Pauline has given me some sweet advice: fair trade, organic sugar. I know many people steer clear of sugar and use all kinds of natural substitutes. But I like baking, which seems to go well with using sugar. I've been using regular refined sugar (even while knowing this was probably not such a good thing due to all the processing, etc). "Our organic sugar is produced from certified organic sugar cane grown on a co-operative of sustainable family farms in Paraguay. The Sugar Mill is energy self sufficient – we use the crushed cane stalks, called bagasse, as fuel for the boilers which generates the electricity for the mill, so we do not use any fossil fuels. We ‘green cut’ the cane – which means that we do not burn or spray the fields and the sugar cane is cut by hand. The leaves and tops of the cane plant are left in the field as a nutrient source for the soil and as a natural form of weed control." I can find the sugar at my local Whole Foods, but the best part is, Pauline found it at Costco for a super-good price! 10 lbs of sugar for $7.99. Just in time for holiday baking. Thank you Pauline and Amy! I was looking for organic sugar in my local grocery (of course there's none) so off to Costco I go! Do they make brown sugar, too? Holiday baking here we come! How does the organic sugar compare to Turbinado sugar (or raw sugar)? Not sure whether it's organic but back in the 70's when my kids were little, Turbinado was the healthy alternative to regular sugar. I notice that they still sell it at Whole Foods. Of course, one way to use less sugar (organic, raw or otherwise) is to literally use less that most recipes recommend!